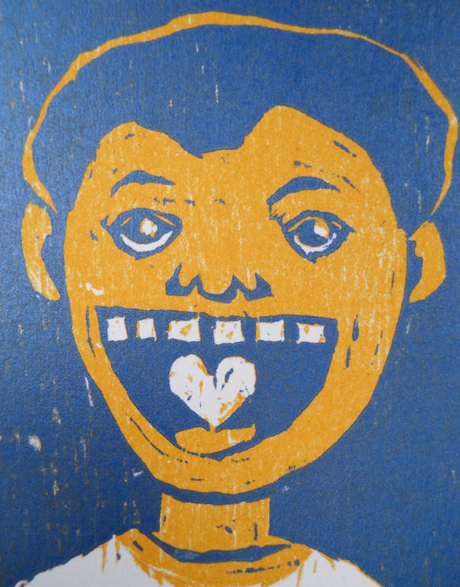 In the “letterpress/zine” circle artnoose is a superstar. 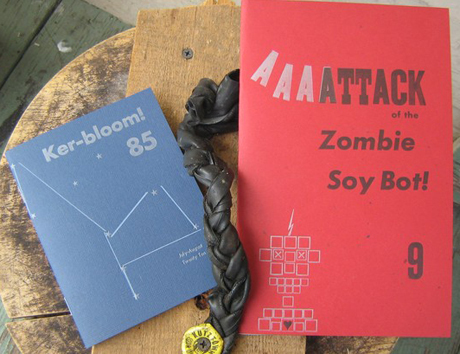 Admittedly, this is a smallish orbit, but lately interest in zines and letterpress is exploding. I ran into her the other day when she was printing in the damp basement of the Cyberpunk Apocalypse. Cyberpunk Apocalypse is a two-house writer’s colony in Pittsburgh. It is where my son Dan McCloskey lives and works, too. 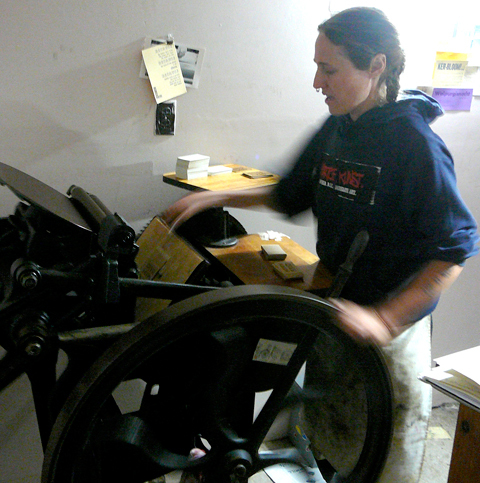 She reveals a few more details on her Etsy page bio: artnoose began letterpress printing the zine Ker-bloom! in the summer of 1996 and has been making it every other month since then, never late, never missing one. After 14 years in the Bay Area, artnoose moved to Pittsburgh in the hopes of transforming a derelict old house into a loving and productive home. While the city home buying process takes its own sweet time, artnoose is a writing resident at the Cyberpunk Apocalypse Writers’ Collective. 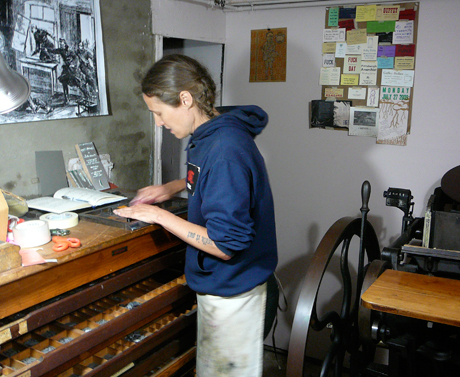 A decade ago, artnoose started a letterpress studio called Crafty Cards in Alameda, California. The name was inspired by the Beasty Boy’s song, ‘She’s Crafty.’ One day in 2004, Crafty Cards got a small commission to print an engagement announcement. The bride-to-be wrote for a trendsetting blog called The Daily Candy. The day The Daily Candy wrote about artnoose, her phone rang off the hook. She got a year’s worth of work, and quit her day job as a substitute teacher. She has been a printer ever since. Last year artnoose launched a successful Kickstarter campaign to create a Letterpress House in Pittsburgh’s Upper Lawrenceville neighborhood near the Cyberpunk Apocalypse. Kickstarter is becoming a popular way for artists, among others, to raise funds to realize their dream projects. Her Kickstarter pitch is worth looking at, she raised $4620. Daniel McCloskey did the illustrations for that Kickstarter video. artnoose says the secret of Kickstarter success is “to tell a compelling story.” Her years of Ker-bloom! have clearly honed that skill. $4620, believe it or not, is enough to buy an abandoned fixer-upper from the city of Pittsburgh. For the price of a Williamsburg loft you could buy a Lawrenceville block. Pittsburgh artists are quick to point out, however, the buzz is not about cheap real estate, it is about the human energy and synergy of the arts community there. The morning I watched artnoose printing she had just been stood up by a “key guy” who was supposed to give her a walk-through of her future Letterpress House. Yes, maybe you can get a house in Pittsburgh for a song, but there is a lot of bureaucracy, red tape, and waiting. Working the press keeps artnoose sane and fit. artnoose’s most recent Ker-bloom! (#89) is in the form of a Mad-libs autobiography. You and your friends pick the nouns and verbs to round out the story of her life. It is available for just $3 on Etsy. 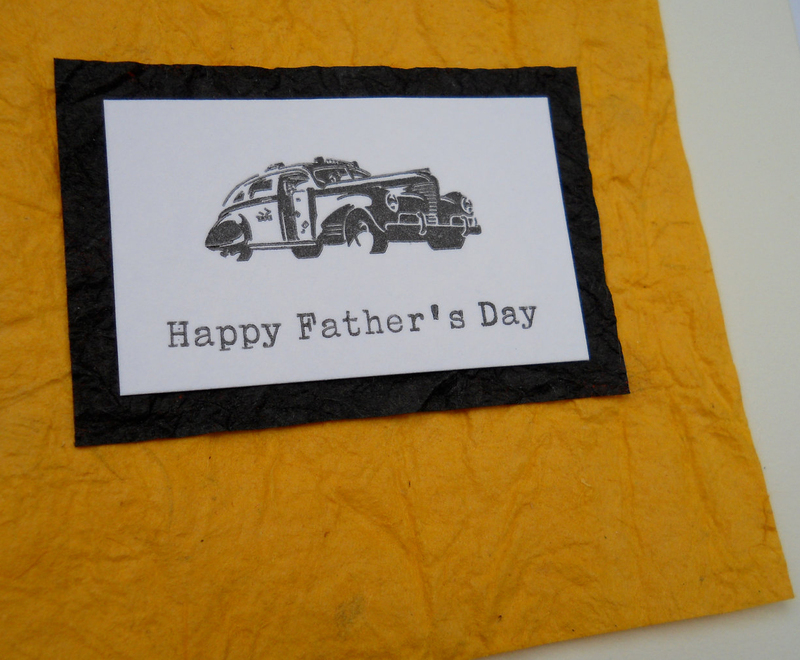 Wanna buy Dad a unique Father’s Day card? artnoose has this and other hand-set goodies for as little as $1. She also still does custom wedding, shower, engagement, birth announcements, and business cards. I would love to be in Pittsburgh to witness the massive cast iron Chandler and Price press moving to its new home. The machine weighs nearly 1500 pounds. A friend of artnoose’s who makes bike messenger bags is rigging canvas harnesses. artnoose plans to enlist a crew of ten to dress as draft animals. Clydesdales, reindeer, and oxen will ever so slowly heave the press over rollers made of steel gas pipes. They will proceed down the back alley, Dresden Street, then take a left at 53rd Street. It should be a sight to see and a story to tell. 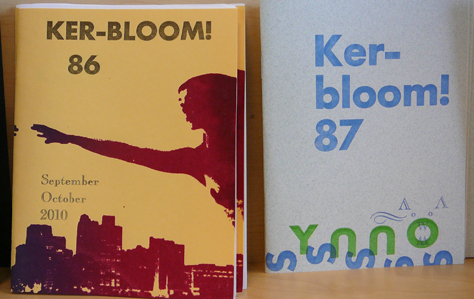 Ker-bloom! < Previous Call for Entries KUTZTOWN B’day logo. Next > Get Creative: Try a Cool-Off!